Last month I introduced you to artist Stephanie Birdsall. Today I'm even more excited to introduce you to artist Mary Qian (pronounced like Chien). From the moment I found out that Mary would be doing a demonstration at Saks Galleries I was giddy with excitement. I love her work! LOVE IT! LOVE IT! Mary paints florals and figurative. I am a huge fan of her figurative work so I was hoping she'd be painting a person for her demonstration but I didn't let my hopes get up too high because I knew florals would be much easier to set up. When we showed up Mary was already painting and it was a figurative! I can't even begin to describe how my craziness and excitement went off the charts and I couldn't even sit down. I'm sure Mr. H wanted to hide and not claim me as his wife that afternoon. I know I must sound like a fan meeting a celebrity or something, but to me it was sort of like that since I loved her work so much. As she painted she described using techniques of hard and soft edges to keep the viewers eyes on the canvass. She talked about using a light easel so she can carry it around if she is painting on site. She even uses styrofoam plates instead of a traditional paint palette because they're so much lighter to hold for extended periods of time. I love this one of the model taking a picture of her portrait. Can you just imagine if Mona Lisa or The Girl with the Pearl Earring jumped up after their sittings to take a picture of the painting? My favorite work of hers is "An Innocent Gaze". I just love the girl's face, how serene it looks. I also love the colors in the painting. Here are some other ones I love. After going home and obsessing thinking about it for a few days, we went back and purchased An Innocent Gaze! Here it is in my dining room. I just love it so much and make it a point to sit down and truly appreciate it for a few minutes each day. Don't forget to enter my giveaway if you would like a chance to win the herb box made from a wine crate. Just visit my previous post for details! Congratulations on your beautiful new painting, Khammany!! Really beautiful. 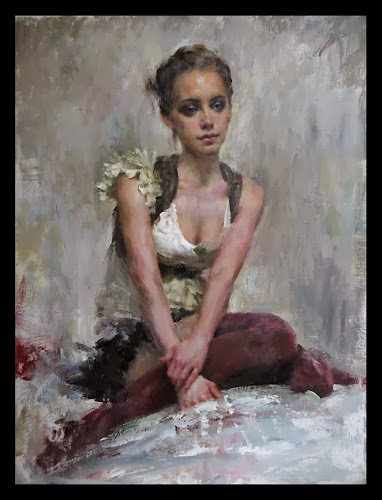 Thanks for featuring Mary Qian's work. What a talent she is! This is so beautiful! I'm in love! I hope are works are affordable, since they are so beautiful and almost like pictures! The eyes are what captured my attention the most!!! Love it! Thank you for sharing this talented artist with your readers! I am not familiar with this particular artist, but we have several paintings of women in our home too. I will definitely go to Mary's website! Absolutely beautiful! What a talent and so glad your are also a big lover of art! Wow - that is one beautiful painting Khammany. It looks so lovely where you have hung it - I am so glad you take the time to sit & appreciate it each day - I love her figurines, but also her flowers look so real also. Thanks for sharing the very talented ladies work ... I would never have known about her otherwise. Her work is amazing. I can't believe that someone could be so talented. It's definitely God-given! How awesome it must have been to see this painting in real life. It turned out stunning - I love the model's clothes and the chair she sat in. What a thrill to purchase one of the artist's painting. It looks lovely in your home. Amazing artist. I love Lily and Liberty. Oh, her work is beautiful. I'm so glad you went back and got the piece "An Innocent Gaze" because it just looks like something that I would have in my home too. What a wonderful artist she is. It looks lovely in your dining room. wow is she talented! So happy got a painting of something that really spoke to you! Enjoy it. Wonderful painting, and so much talent. Love the painting you were able to get, looks great in your dining room. 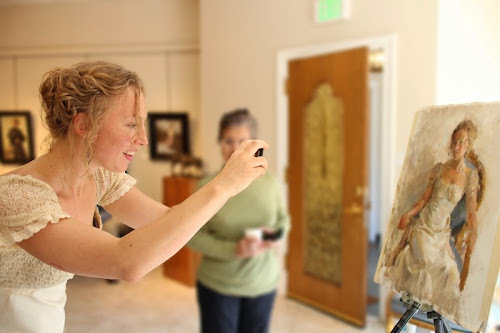 How exciting to watch the artist at work and own one of her beautiful paintings. I'd have a hard time tearing myself away from it if it hung in my home. I loved this post, Khammany and could feel your excitement; it JUMPED off the screen! Mary Quian is obviously a talented and gifted artist. 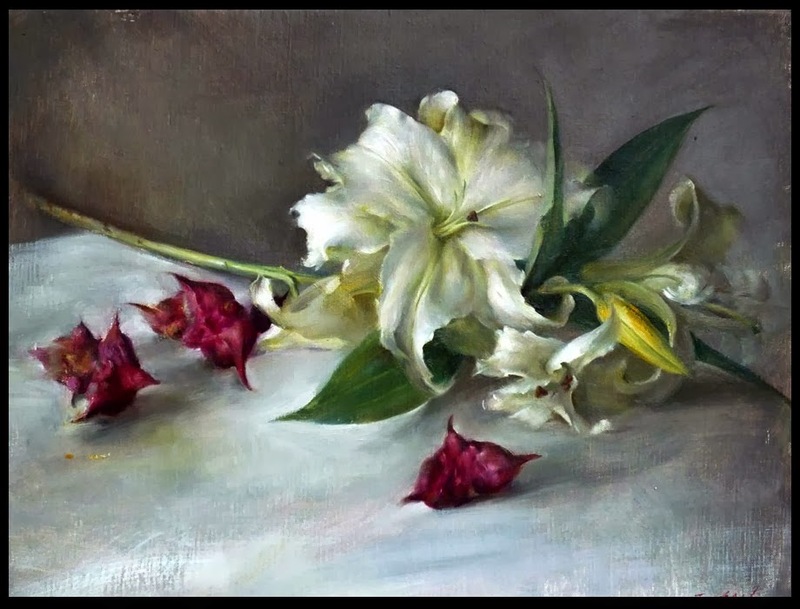 Both her florals and figuratives are most intriguing - the detail! Thanks for introducing us to her, for featuring her in action and congrats on your new painting; it is beautiful. Thanks for entroduicing me to such a painter. Her work is very interesting and I can't believe yoou have that paiting to watch every day! How amazing....her art looks so real! I'm glad you bought the one you liked best. You'll enjoy it for years to come! Have a good weekend! Hugs! What a wonderful painting. I am in awe of artists who can paint like Mary Qian. What beautiful art you have posted. thank you for your visit and comment on my blog. A beautiful post of an amazing talented artist. Your purchase is stunning. 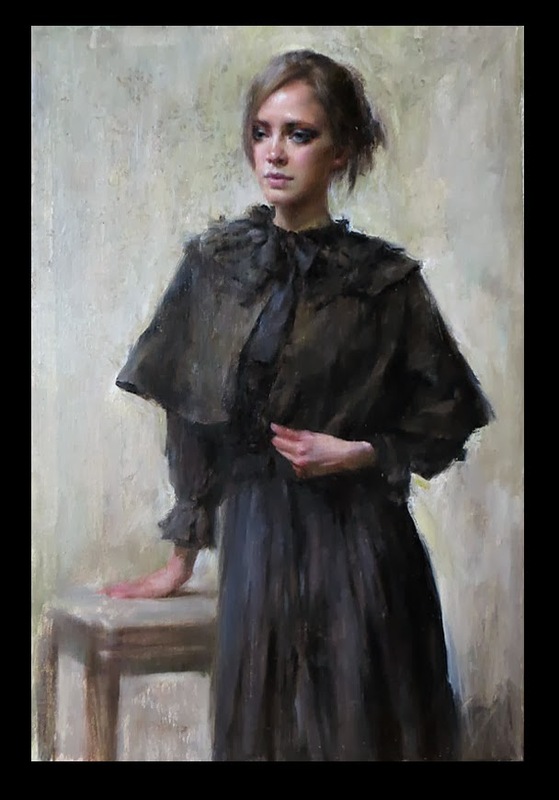 I just discovered Mary Qian. I just started painting at the beginning of the year 2015 after 41 years of not doing any art at all. 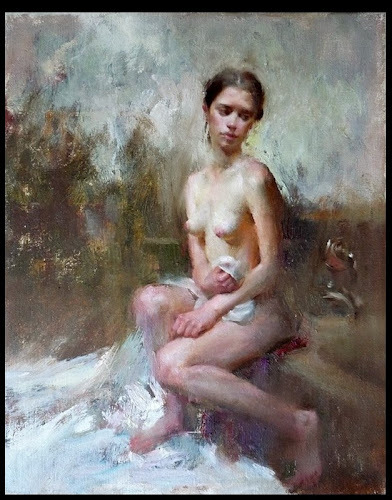 I like the work of Mary Qian because I like her style or shall we say her brushwork. Therefore I look upon Mary Qian as someone whom I would like to say inspires me.